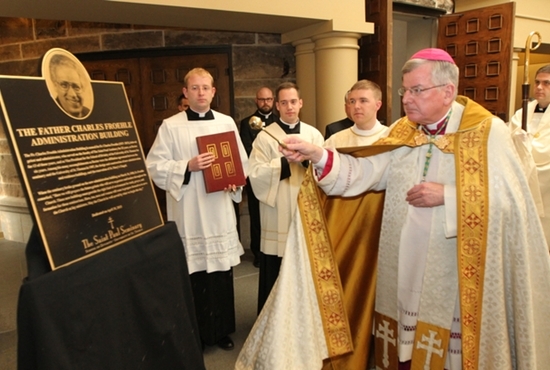 Archbishop John Nienstedt blesses a plaque in honor of Father Charles Froehle during a dedication ceremony April 30 at the St. Paul Seminary. The administration building of the seminary has been named in honor of Father Froehle, a parish priest who also served the seminary for 25 years as a professor, dean and rector. Father Froehle, who died Jan. 6 at age 77 after a lengthy illness, graduated from the seminary and was ordained a priest in 1963. In 1980, he was appointed rector and was one of the major architects of the 1987 affiliation of the seminary with the then College of St. Thomas.